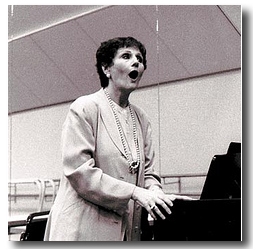 An internationally renowned recitalist, Marlena Kleinman Malas graduated from the voice program of the Curtis Institute of Music in 1960. She has performed with the Metropolitan Opera Studio and has been affiliated with opera companies in New York City; Santa Fe; Boston; Miami; Washington, D.C.; and Milwaukee. She has been a soloist with the New York Philharmonic and the Philadelphia Orchestra and has appeared at the Marlboro, Casals, and Ravinia festivals. Ms. Malas is chair of the voice department at the Chautauqua Institution and a faculty member of the Juilliard and Manhattan schools of music. She has given master classes in connection with the Metropolitan Opera and at the New National Theatre in Tokyo; Opera Theatre of Saint Louis; Castleton Festival in Châteauville, Virginia; Pittsburgh Opera young artists program; Boston University; Blossom Music Festival; San Francisco Opera Center; Santa Fe Opera; European Center for Opera and Vocal Arts in Brussels; Israel Vocal Arts Institute in Tel Aviv; and (with Joan Sutherland and Luigi Alva) Australian Opera in Sydney. She is a consultant to the Canadian Opera Center; Fletcher Opera Institute, where she has given master classes; and Washington Opera Young Artist Program, where she is also a teacher.